I definitely like this book better than Book 1 or Book 2 of the series, and really my rating should be 3 1/2 stars. I couldn't bring myself to give it 4 stars, though, because I don't "really like" it. Mainly, I was quite pleased to see that Ivy and Bean's adventures in this book did not involve being mean or disrespectful to other people. Ms. Aruba-Tate, in a clever move that shows how great a teacher she is, gets a distracted Bean back on task (reading) by introducing her to "The Amazing Book of World Records". The rest of the book is about how Ivy and Bean go about trying to set a world record. I LOVE the way the book introduces readers to Mary Anning, a real British paleontologist who dug up an ichthyosaur at age 12. Mary Anning gives the girls the confidence to believe that even a 12-year-old girl can do something big and important. There is also a healthy "don't worry about what other people think" message in this book. Ivy and Bean enjoy their paleontology activities, and they forge ahead, even though their peers might doubt and ridicule them. This book really had the potential for 4 stars, but in the beginning, I was disappointed in the way Bean - not surprisingly - did not respect Nancy's property. Also, I was a bit uneasy about the way some of the kids were going about trying to break world records. In the end, it's clear some of the ideas were bad ideas, but it almost seemed like this book should have come with a "Kids, don't try this at home!" warning. Finally, towards the end of the book, the name-calling appeared. If Isabelle did not before know the "L-for-loser" hand gesture, she does now. Sigh. What characters these two girls are - Bean is an extrovert and naughty, Ivy is quietly subversive. When Bean decides she wants to break a record - any record will do - Ivy is right there with her. And when the record of sticking straws in your mouth doesn't work, and when Bean gets into trouble for trying to shatter glass by screaming, without warning her Dad, it's Ivy's talking about Mary Anning that points Bean in the right direction. Mary Anning was the first person to find a whole ichthyosaur fossil, and she was only 12. Bean very quickly convinces them both that of course there'll be dinosaur bones in her backyard and they're digging their way to becoming the youngest paleontologists ever.My grandchildren loved this just as much as the first two in the series, and I am still loving reading them aloud. I really enjoyed reading this book. I consider it chapter book for young readers. It still has pictures and some pages with very few words. It is about two girls, Ivy and Bean, and how reading a book about amazing world records sparked their interest in breaking a record. I felt that I could really relate to this book and I think students could as well. It is fun and very realistic! Ovela opettaja saa levottoman Bean keskittymään "jätä kaikki muu sikseen ja lue" tunnilla tarjoamalle tälle Suurta ennätyskirjaa. Välitunnilla kirjasta innostuu koko luokka ja ennätystehtailu alkaa. Jotain hauskaa ja koukuttavaa näissä kirjoissa vain on. Neiti 9v luki tämänkin osan yhdellä istumalla ääneen naureskellen ja vei sen sitten tyynylleni odottamaan, että muistan varmasti lukea ja "arvostella". I really liked this book because ivy and bean got encouraged to find dinosaur bones in her backyard and they found some but they were bones that the persons that lived there theire dog used to hide them in holes. I would recommend this book to my sister when she is more older because maybe she could also enjoy reading the books of them and it could encourage her to do something in the book. Ivy and Bean never thought they'd be friends. Bean is wild, a practical joker with a sharp tongue. Ivy is smart, someone who reads tons of books and has a bunch of inventive ideas. Now united in friendship, Ivy and Bean compliment each other perfectly. Nothing can stand in their way.This book started off pretty slow. I wasn't too interested until the second half. Bean is bored in Drop Everything And Read (or, the DEAR program). Her insightful teacher has anticipated this and hands Bean a Guinness Book of World Records. Score! Bean, and everyone else in the class, is fascinating by the weird things people did to break records. Immediately, each kid makes a plan to break a record. Zuzu plans on doing 110 cartwheels in a row. Eric plans on eating 401 M&Ms in one minute. Emma plans on hanging 16 spoons from her face.What can Bean do? She sees that a woman has broken a wine glass with her voice! Perhaps she can do that.Ivy, meanwhile is reading a book about Mary Anning, the female paleontologist that discovered dinosaur bones at age 12. When breaking glass with her voice doesn't work for Bean, she and Ivy decide to dig up Bean's backyard for dinosaur bones.I liked that Barrows used Mary Anning, a real-life girl who did cool stuff, as a role model for the girls. Interested readers may want to look her up (don't expect a long attention span, just about two minutes of looking at pictures of her and discussing).I adore the conversation Bean and Ivy have about whether other people believing you is important. "Who cares what other people think? "Bean stepped over a crack in the sidewalk. "I do. I want other people to know I'm right. Especially when I really AM right." Ivy thought for a moment. "But you're still right, even if they don't think so." "I guess." Bean sighed. "I just feel better if other people think I'm right, too." "Hardly anybody ever thinks I'm right," said Ivy. Bean nodded. That was true. A lot of people don't understand Ivy's ideas. She had had plenty of practice at not being believed. That's probably why she didn't get as mad about it as Bean did. She just went ahead with her ideas anyway. You can do whatever you want if you don't care what people think, Bean realized. But you have to do it alone a lot of the time. Wow, I like this philosophical thinking for 7-year-olds. Nicely done, Barrows.I also really like Bean's dad's attitude in this book. Bean and Ivy cause a lot of trouble. They break dishes, steal Nancy's (Bean's sister) glass octopus, and generally run around making messes. But in this book, Bean's dad admits he misses them when the house is empty. He feels lonely when they're away. He also doesn't freak out and yell when he finds out they've dug multiple holes while excavating the backyard. I know it's probably unrealistic for a real-life parent to be this cool and patient, but I enjoyed it in this fictional account.Ivy also acts really brave in this book, speaking publically even though she knows she's going to disappoint people with the news she has to share. Barrows always makes Ivy do something brave in each book, which is great and really helps even out her bookish, dress-wearing side. It's easy to forget that she's just as much of a powerhouse as Bean, although in a different way!In conclusion, these books really capture the 7-year-old voice. The adventures and problems the girls get into are pretty realistic and true to life. Their thought processes and rationale is spot-on, exactly what little kids think and say. Amazing work by Barrows. Great illustrations, too. I love Ivy and Bean. Plain and Simple.My first encounter with this duo came thanks to my niece, who's eight, and absolutely adores these books. As the "cool librarian auntie", I was next in line to read them after she finished (traditionally, she saves books she likes for me to read, and I read her ones I like when she comes to visit). I wasn't quite sure what to expect, because while I love children's literature, I often find writing for kids at this age to be hit or miss - it can be ridiculously underdeveloped or overwhelming mature. However, "Ivy and Bean" struck the perfect balance: The girls are intelligent and unique, balancing each other's personalities in a realistic way, and their antics are genuinely funny without being bizarre or zany. The author hints at the fact Ivy can be considered "weird" by her classmates, and doesn't shy away from Bean's sometimes difficult relationship with her sister. It’s a book with a lot of relatability, and both characters feel more developed and less one-dimensional because of it. The inclusion of Mary Anning and paleontology is interesting without being overly explanatory or boring, and I was excited that Ivy and Bean’s interest in the subject wasn’t considered odd because of their gender (some books still suffer from the “boys-like-dinosaurs, girls-like-dolls” stereotype). Overall it's a fun, well-crafted book, and I'm excited to read the next one my niece passes on. My favorite of the first three in the series. I started to understand these two little seven year olds better. I was laughing out loud so much. Two other characters that need a mention: Mrs. Aruba-Tate, Ivy's and Bean's second grade teacher, is perfect. I hope my daughters second grade teacher turns out as in-tune and loving as her. Bean's dad is cool. He gets his handful of a daughter and knows how to meet her needs positively.The best compliment for this series comes from my seven year old, "I love these books even more than Magic Tree House!" (and she really likes Magic Tree House)I think boys at this reading level would enjoy the tales of these two friends, as well. These girl's are always up to something adventurous and wild. Put this book in my daughters Easter basket in place of candy and read it aloud to her this week. She is six and in kindergarten, so not up to reading chapter books on her own yet, but able to sit still and listen to longer stories out loud. She also enjoyed the pictures.I loved that the book introduces Mary Anning, whom I first read about in a book by Tracy Chevalier. And I loved the "it doesn't matter what other people think" lesson, AND the lack of toilet humor. I wasn't crazy about Bean sneaking into her sisters room but I cracked up at the part where she screams to break a glass and her father comes running in panic. I read this to my 5 year old. It was cute and funny. She liked all the pictures. There are drawings on almost every page.It is our second pass through because it did not hold my kids attention as well as the first two.I have to say though, Ms Aruba Tate sounds like an amazing teacher and Bean's father is such a sweet Dad. Ivy and Bean are absolutely hilarious. Perfect for kids who like Ramona or Junie B. or Judy Moody. Just perfect these girls. I always love to see what kind of trouble they can cook up together. Very enjoyable. Head and shoulders above lots of other school / friend/ family stories. Reminds me a bit of the Ramona books. p. 87 - "you can do whatever you want if you don't care what people think, Bean realized. But you have to do it alone a lot of the time." What is there for a kid to NOT love about this book? World records, dinosaur bones, and two of the most fun seven year old's the chapter book genre has known. Complete delight. I hated this book! I don't recommend this book for anyone. Ivy and Bean's teachers name was Miss Aruba-Tate and Ivy and Bean read really her whole class it. Ivy and Bean tried to break a record. Bean wanted to wash the dishes and wanted to break a record. So her Dad looked at the dishes. He said, "Bean, you could break a record for the fastest dish washer." Ivy watched the clock but Bean didn't get it done on time. Actually, just four stars because I didn't like it that much. I did not like it as much as the 1st book because,It was a little boring,But....kinda funny.I wish Ivy and Bean would of actually found some real fossils. Ivy and Bean are trying to set a world record. They chose to beat the world record by being the youngest paleontologists. The best book of the first 3 in the series. Read it when I was little. It is a very interesting and fun book! I agree with other reviewers that liked this book in the Ivy & Bean series better than books 1 or 2. The reason for my greater liking is that the main characters Ivy and Bean behave more acceptably (to me) than in the previous books. Yes, they still have fun, in an innocent, 7-year-old exploring their environment type of way, but they display more self-control and adherence to the "rules" in this one.The adults in the book, particularly Ivy and Bean's teacher and Bean's dad, also display noteworthy, positive support of the girls, by helping to redirect their inquisitive 7-year-old minds and still allowing them to have the freedom to explore their world and make good choices.There are several laugh out loud moments in this book, and the friendship between the girls continues to grow stronger. My daughter read this book and then wanted to read a book of world records. She hasn't asked to try to break a world record...yet, but I'm waiting! She definitely is excited to read book #4 in this heartwarming, realistic fiction series for younger grade school children. "Ivy+Bean" by Annie Barrows is a realistic fiction book. The main character is Ivy and Bean, and they are so curious, mischievous kids. They are best friend, so they're doing altogether. I think series of Ivy+Bean is has fun episode. It always make me laugh. This illustration is so fun. usually in the book, there are many of details on the text. but this book has details on illustration more. it had a lot of illustration to make not boring. In the school, Bean thought if they can break the world record, it will be amazing thing, after she got book about world record. She tried, tried and tried! but all result was not good. Then she thought if she discover many of bones from dinosaur, they can be famous. So they dig, dig and dig. If you want know what is result of digging, read this book!I think it is so great book. I think if it have more story, or more specific detail, I guess it will be more good. So I little disappointed. I recommend this book to second grade or first grade. I liked the book because Bean got a book of world records. There was a record that this boy stuck more then 11 spoons on his face! Somebody tried to do it she got the first 3 on easy...but it was the rest of them that was hard. A girl in the book did 100 cartwheels in a row! A girl tried to do it but only did 57 then hit her fence. She hit her knee on her fence and got a ton of splinters.I wish there was a record for tons of splinters. Ha ha ha ha. A record said a boy ate 400 M&M in a minute! A boy tried to do it ...but he ate 210 and hurled. Bean rea1ly really really wanted to set a record. Ivy was in the process of reading a book on a woman that digs up bones. Ivy said"this book is amazing". She was a archeologist. Bean asked Ivy what a archeologist was. She said an archeologist was a person that digs up bones. Then Bean had an idea...they will be the youngest archeologists in the world! They had some luck they found more than 18 bones on their first go round! 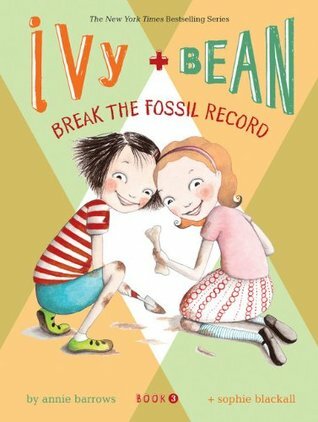 "Ivy and Bean Break the Fossil Record" was written by Annie Barrows. These crazy little second grader girls (Bean and Ivy) have the world-record fever. They now want to set their own record. Bean wants to try everything: stuffing her mouth full of straws, speed-washing dishes, and even screaming the loudest.Then, Ivy and Bean decided to become the youngest person to ever discover a dinosaur. Through the book, they share their adventures on how they try to set this world record. The Illustrations in the book were drawn by Sophie Blackall. These comical and contrasting drawings make this book more enjoyable to read. Because the illustrator drew the two characters completely the opposite of each other, it makes the book more fun for the students.This book should be read by 4th graders through 5th graders. The students should be starting to read chapter books at this time and this would be a great book for them to start with. Bean finds "drop everything and read" time tedious at best. (Sophie Blackall draws a cute picture of everyone reading but Bean who sits with her book on her head and her head in her hands.) Then, Ms. Aruba-Tate drops a book on her desk and everything changes. The book? The Amazing Book of World Records! Some man eats 30 scorpions a day! A boy hung 15 spoons off of his face! Someone else ate 400 M&Ms in one minute! The second grade can talk of nothing else as each student tries to decide how he or she will become famous. And, of course, Bean and Ivy are in the thick of it as they set out to become the world's youngest paleontologists!! As I've said before, I like the fact that Barrows puts believable characters in realistic situations. I can just see two second-graders digging in a backyard for buried dinosaur bones. I chose this book because I liked the previous books. The plot of this book is when Ivy and Bean receive this book from their teacher the book is called world records. They both want to sign up for the contest ,they tryied multiple times but they failed so finally the try to dig fossils and that worked so they won the world record!! !.My favorite quote in this book is "Bean turned her book upside down and tried to read it that way ". I love this quote because I dont like it when teachers or parents tell you what to read. I think this authors writting style is not only funny but its short. For exsample she does not write to many scentences or chapters. The author is basically writting about her life growing up and I think that she is writting as both Ivy and Beans point of veiw. I would recommend this book to anyone that likes short stories and comedy. Annie Barrows Sophie Blackall - Annie grew up in Northern California, and graduated from the University of California at Berkeley, with a degree in Medieval History. Unable to find a job in the middle ages, she decided upon a career as an editor, eventually landing at Chronicle Books in San Francisco, where she was in charge of "all the books that nobody in their right mind would publish." After earning an M.F.A. in Creative Writing at Mills College, Annie wrote (as Ann Fiery) a number of books for grown-ups about such diverse subjects as fortune-telling (she can read palms! ), urban legends (there are no alligators in the sewer! ), and opera (she knows what they're singing about!). In 2003, Annie grew weary of grown-ups, and began to write for kids, which she found to be way more fun.